1. In a medium bowl, whisk together the yolks, sugar, and cornstarch; set aside. 2. In a medium saucepan, bring the milk to a gentle boil. Remove the pan from the heat and whisk about 1/2 cup of the hot milk into the yolk mixture. Return the entire mixture to the saucepan containing the remaining milk. Place over medium-high heat and bring to a boil, whisking constantly. Continue to boil, whisking constantly, for 1 minute. Remove the pan from the heat, scrape the bottom of the pan with a spatula, and whisk until smooth. Whisk in the butter pieces until melted. Quickly strain the custard through a fine-mesh sieve into a medium bowl. Whisk in the vanilla extract or paste. Cover the surface of the custard with plastic wrap. 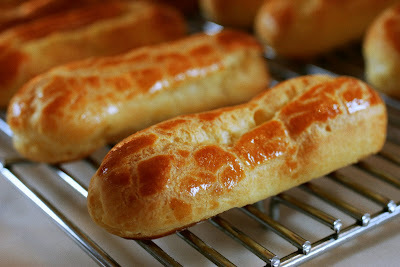 Let cool to room temperature and then refrigerate for 2 hours (or up to 3 days), until well chilled. 3. In the bowl of an electric mixer, using the whisk attachment, beat the heavy cream until it forms soft peaks. Fold one-third of the whipped cream into the custard to lighten it. Fold in the remaining cream. Cover the bowl with plastic wrap and refrigerate the filling until ready to assemble the éclairs. 4. Position a rack in the center of the oven and preheat the oven to 400°F. 5. In a medium saucepan, combine the water, milk, sugar, salt and butter and bring to a full boil over medium-high heat, stirring frequently. Add the flour all at once and stir vigorously with a wooden spoon until the flour is completely incorporated and the mixture pulls away from the side of the pan. Continue to cook for another minute, stirring, to dry out the dough a bit. Transfer the paste to a medium bowl and, using the wooden spoon, beat in one of the eggs, mixing vigorously until smooth. Continue to beat in the remaining eggs, one at a time, mixing until smooth before adding each egg. Mix until smooth and shiny after the final egg has been added. 6. Line a baking sheet with a silicone baking mat or piece of parchment paper. Scrape the warm choux paste into a large pastry bag fitted with 5/8-inch plain tip (such as Ateco #7). 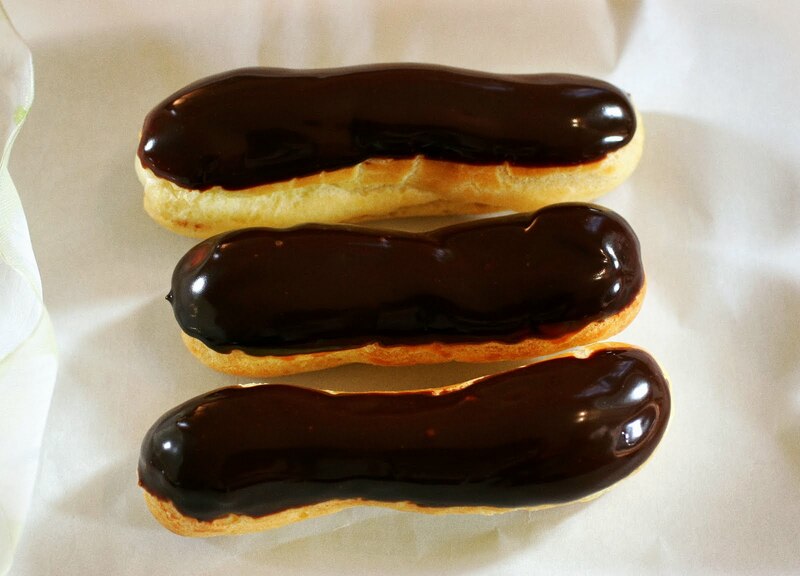 Pipe out 4- to 5-inch long logs of the choux paste onto the sheet, leaving 2 inches between each éclair. 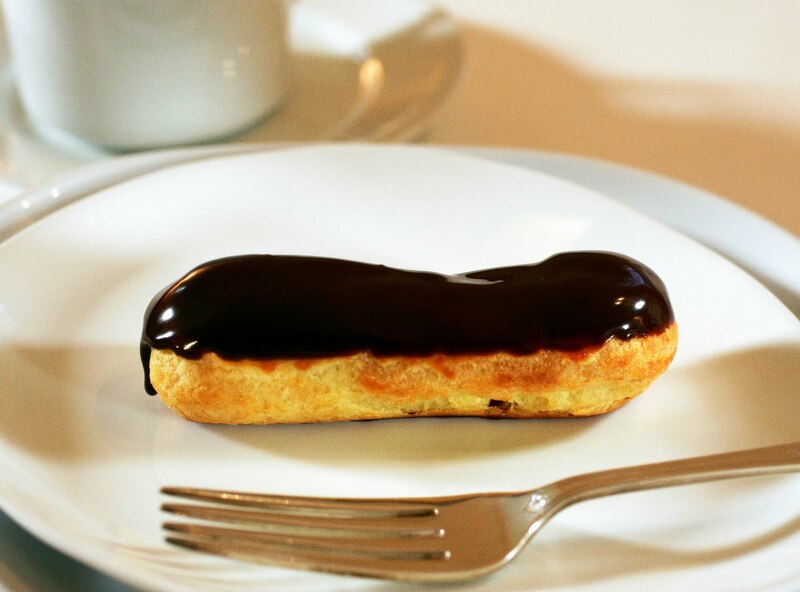 Brush the surface of each éclair with the egg wash. Use your fingers to smooth out the points on the surface of each éclair. Bake 15 minutes, then reduce the heat to 350°F degrees and bake until puffed up and light golden brown, about 10-15 minutes longer. Let cool on the baking sheet. 7. Use a small, plain pastry tip to make a hole in an end of each éclair. 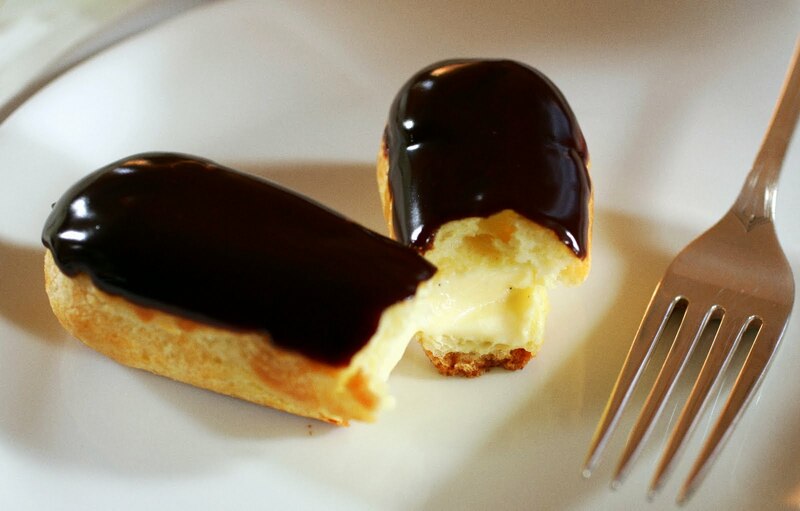 Using a pastry bag fitted with a ¼-inch plain tip (such as Ateco #802), gently pipe the custard into the éclairs, using just enough to fill the inside. 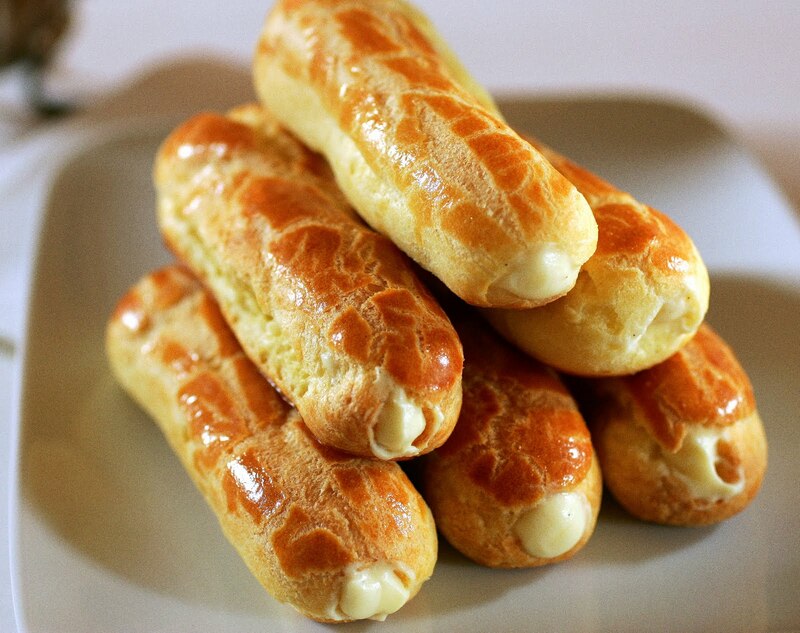 Set the filled éclairs aside in the refrigerator while you make the glaze. 8. Place the chocolate in a medium bowl. Combine the cream and corn syrup in a small saucepan and bring to a boil. Pour over the chocolate and stir until the chocolate is completely melted and the glaze is shiny.